The Elbe is a Central European river with a length of 1091,47 km who rises in the Czech Republic, and flows throught Germany and into the North Sea. 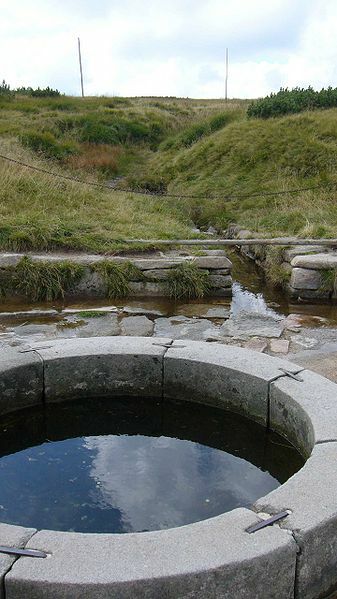 The source is in the north of Czech Republic at the border to Poland in the giant mountains at a value of 1386 m over the sea. The main comb of the giant mountains runs majority in westeastern direction and forms the border between Poland and Czech Republic. The giant mountains are characterised by a complex geological structure and is at the same time a Watershedbetween the North Sea and the Baltic Sea. 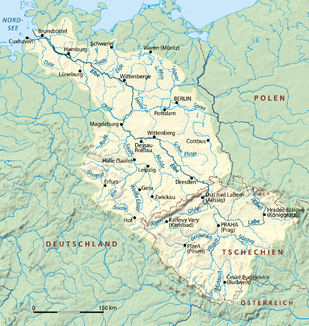 The rivers of the Czech south side drain over the Elbe into the North Sea, the rivers of the Polish north side over the Oder into the Baltic Sea. In Poland and in Czech Republic the giant mountains stand as national park under nature protection. Large parts of the giant mountains stand additionally as biosphere reservation under the protection of the UNESCO. The giant mountains consist predominantly of old magmatic rock (developed from the hot rock melt = magma). Above all in the center we have Plutonite (depth rock) granite, in the east and southeast find one metamorphosis of rocks (Ergußgestein results from the transformation under pressure and high temperatures) from granite: Gneis and mica slate. The giant mountains can arrange as border line between high and low mountain ranges, it exceeds in several ranges the 1.500-m-Marke and exhibits also a typical high mountain vegetation, its surface forms is there however predominantly from low mountain ranges comparable to those. 2) Call me the highest mountain in the giant mountains with the elevator indication as well as the length and width of the giant mountains. 3) From which geological rock material the giant mountains exist mainly?